Chia seeds are the grain of the Salvia hispanica L. plant, a member of the mint family. They have become a popular health food item for their high concentrations of omega-3 fatty acids as well as fiber, minerals and protein. There is, however, some doubt as to the availability of the protein and amino acids from chia seeds. Protein is made up of varying combinations of the 22 amino acids, which are the individual building blocks of the structure of protein. Chia seeds contain 18 of the 22 amino acids, including all nine essential amino acids: isoleucine, leucine, lysine, methionine, phenylalanine, threonine, tryptophan, valine, and histadine. Chia seeds contain between 15 percent and 24 percent protein by volume, depending upon which nutrient analysis you read. It is possible that chia crops vary in protein content based on the individual characteristics of each crop, the nutrients in the soil, and the weather conditions during the growing season. Compared with grains like wheat or rice, 15 percent to 24 percent protein is high. 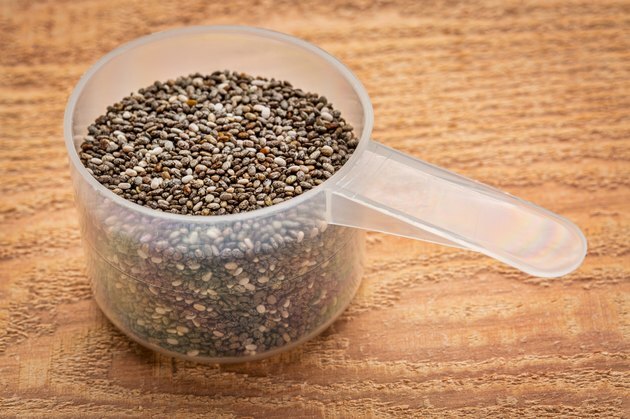 However, at least one study, published in "Revista Salud Publica y Nutricion" in January 2008, found that the digestibility of chia protein is very low. The researchers experimented with raw seeds, toasted seeds, raw flour, toasted flour and soaked seeds. In every case except chia flour, the digestibility was less than 35 percent – so low there's no digestibility classification. The lowest score was the toasted chia seeds, with only 10.84 percent digestibility. Only raw, ground chia flour had a digestibility score high enough to be rated "low digestibility" -- 78.9 percent. Each 1 oz. serving of chia seeds contains almost 11 g of fiber and 5 g of omega-3 fatty acid in addition to the 4.4 g of protein. Even if the protein in chia is not readily digestible, fiber and omega-3 fats are both beneficial to reducing the risk of and improving the outcomes of diabetes and heart disease. On top of those benefits, chia seeds contain almost 18 percent of the daily recommended intake of calcium and about 38 percent of the daily recommended intake of phosphorus.